This keynote lecture reviews the rise and development of automatic machines within Muslim civilisation. It looks at how inventors from the Muslim civilisation progressively transformed achievements of previous cultures (e.g. ancient Mesopotamia, Egypt, Greece, Persia, China and India) and how it developed new sophisticated time measuring devices, irrigation machines and entertainment devices. 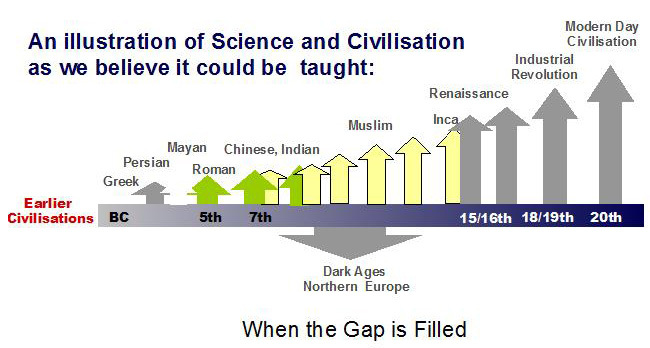 Unfortunately, there is a gap in the educational curricula of about 1000 years overlooking the contributions of non-European cultures such as Chinese, Indian, Persian and Muslim. This anomaly needs correcting. 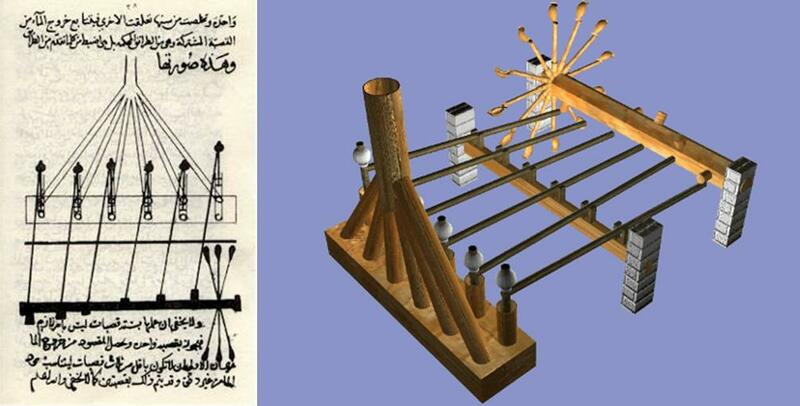 Several examples of inventions in Muslim civilization are highlighted. These include: Caliph Harun al-Rashid's clock that he gifted to Charlemagne, Ibn al-Haytham's novel water clock, and the numerous machines of Al-Muradi in Al-Andalus (Muslim Spain), Al-Jazari and Taqi al-Din in Turkey, and the clocks of Ridhwan al-Sa'ati in Syria, Bou-Inaniya and Al-Qarawiyyin clocks in Fez and others. Reference is made to post Taqi al-Din Ottoman mechanical clocks and the role of the Mevlevis (Sufis) as craftsmen making small clocks. It is proposed that incentives that drove early Muslims to focus on practical knowledge where prompted by their understanding of the religious concept of “useful deeds” (Amal Saleh) as means of demonstrating one’s faith. The story of the rise of machines in the Muslim Civilisation fills a gap in the educational curricula and the public literature. It also inspires the young to derive positive lessons from the past to build a prosperous and sustainable future that appreciates and celebrates diversity of humanity. Time telling devices are amongst the earliest inventions of humanity. Their development gave rise to automatic machines that eventually spread throughout the production industry. The history of automatic machines is a huge subject and has been intimately linked with the development of clocks. Time telling devices received much attention from many authors. However, most of the literature on clocks focusses on devices of European origin. 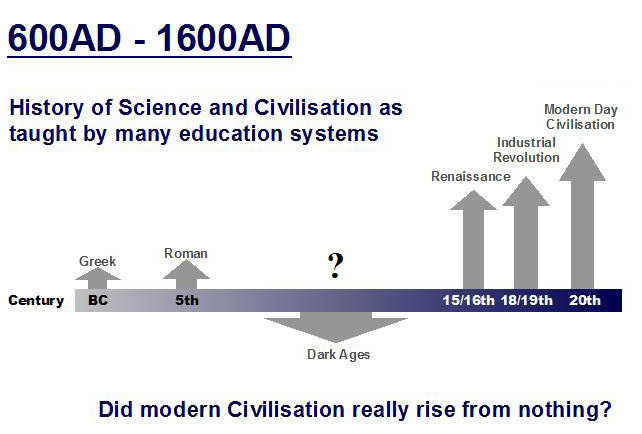 There is a gap in the popular history of science and engineering books regarding the so-called “Dark Ages” or period. The literature tends to overlook the contributions made by the non-European cultures such as the Chinese, Persian, Indian and Muslim. An example of this oversight with reference to clocks may be seen in the official US government page of the US Department of Commerce, National Institute of Standards. A historical review of the development of clocks under the title of “Walk through Time” totally neglects clocks in Muslim civilisation with marginal mention of the Chinese. Although time telling was important to all nations and cultures from the ancient Sumerians, and throughout the Babylonian, Egyptian, Chinese, Indian and Greek civilisations, it was not until the emergence of Islam that its technology and sophistication were given an enormous boost. The need for Muslims to determine the time of the five daily prayers and the direction of the Ka’ba in Makkah from anywhere in the world gave birth to a rapidly growing industry of sundials, astrolabes and clocks of all kinds. This lecture is based on a book by the author on the subject that aims to highlight some of the stories behind clocks and their inventors from the Muslim world. It is also based on a number of papers by the author on automated water-raising and other mechanical machines. Time measuring devices became central in Muslim societies. The development of clocks from sundials to clepsydras, candle clocks, water clocks, geared calendars and mechanical clocks reveal an exciting story of engineering and fine technology. The work of the author and his team at the Foundation for Science, Technology and Civilisation (UK) attempts to investigate ancient clocks, within a geographic area stretching from China to Spain commencing from the time when Abbasid Caliph Hārūn al-Rashīd gifted a clock to Emperor Charlemagne, which then fascinated his court. Although only a few ancient clocks survive, information on ancient devices lies within the confines of manuscripts. The FSTC work relied on published literature and manuscripts to summarise the developments and the working principles of many of these devices. Where possible, modern engineering techniques were employed to understand manuscripts and interpret sketches to produce 3D graphics and pictorial representations. Such information provides a basis for future accurate manufacturing of replicas, for use in film production and for the production of educational resources. Our kings and scientists use the astrolabe by day and the binkamat (water-clocks) by night"
We are not sure from where the sources of clock construction originated in Iraq at the time. However, we know form the names and vocabulary used to describe the parts and names of these devices, that they a mixture of Egyptian, Babylonian, Indian, Persian and Greek origins. Due to the translation movement, many ancient manuscripts were translated to Arabic. 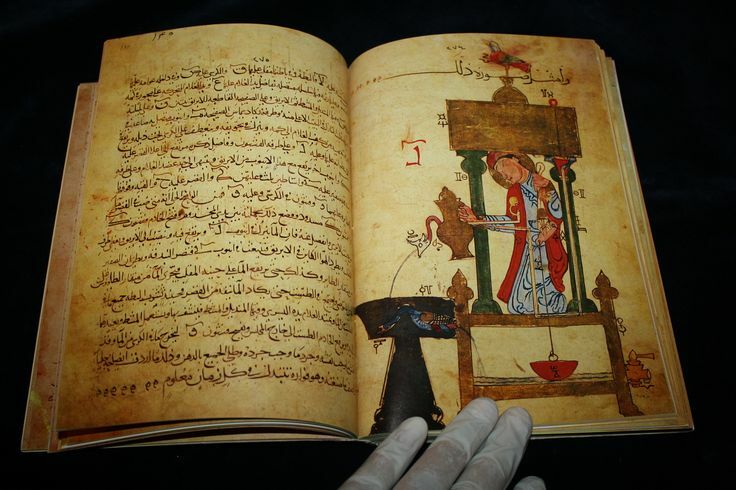 An example is the ‘Book of Archimedes on the Construction of Water-Clocks’ (Kitāb Arshimīdas fī ʿamal al-binkāmāt (c. 250–212 BC), is most likely a 9th century compilation of a number of short works by authors writing in Greek, Persian and Arabic. Figures 6-7. The internal workings of a water-clock. 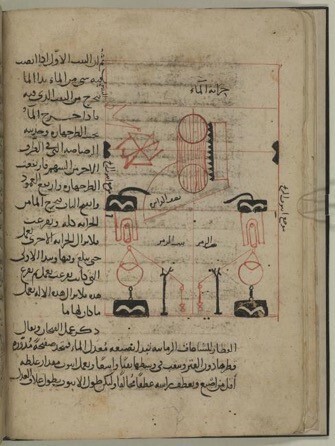 From ‘The Book of Archimedes on the Construction of Water-Clocks’ in Arabic. (Or. 14270, f. 16v). The Archimedes text and others like it would have influenced Engineers and Scientists from Muslim Civilisation such as Ibn al-Haytham, the Banū Mūsá brothers, Ridhwan al-Sa’ati, al-Muradi, al-Jazarī and Taqi al-Din. The clocks constructed in the Muslim civilization seem to be characterised by a combination of engineering and artwork. They would tell time, but would also look pleasing, make musical sounds and generate entertaining movements of a mechanical puppet theatre of human figurines, beasts and birds. Such features generated ingenious ideas and mechanisms in the form of camshafts, escapements, complex gears, control systems and reciprocating pumps. “Radbert, the emperor's emissary, died on his way back from the East. 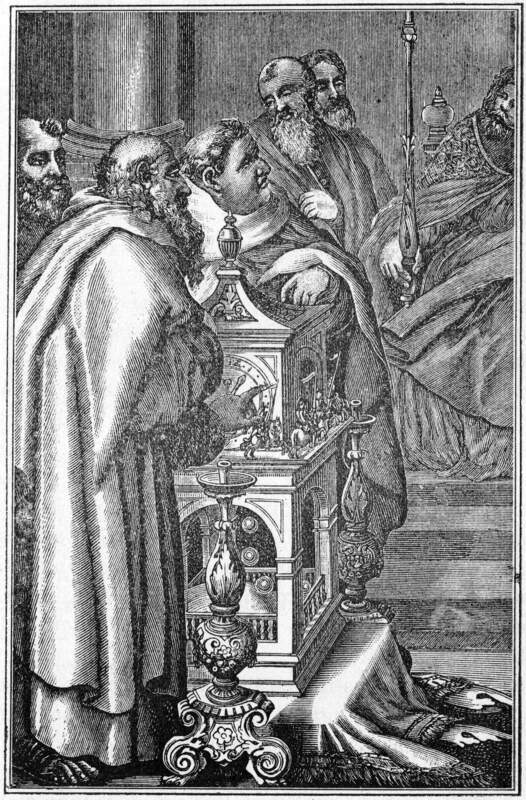 The envoy of the king of Persia by the name of Abdallah came to the emperor with monks from Jerusalem, who formed an embassy from the patriarch Thomas. Their names were George and Felix. This George is abbot of Mount Olivet, a native German and called, by his real name, Egilbald. They came to the emperor and delivered presents, which the king of Persia sent to him, that is, a tent and curtains for the canopy of different colours and of unbelievable size and beauty. They were all made of the best linen, the curtains as well as the strings, and dyed in different colours. The presents of the Persian king consisted besides of many precious silken robes, of perfumes, ointments, and balsam; also of a brass clock, a marvellous mechanical contraption, in which the course of the twelve hours moved according to a water clock, with as many brazen little balls, which fall down on the hour and through their fall made a cymbal ring underneath. On this clock there were also twelve horsemen who at the end of each hour stepped out of twelve windows, closing the previously open windows by their movements. There were many other things on this clock which are too numerous to describe now”. It is interesting to note that in Wood’s book, which chronologically examines over 600 individual clocks and watches, the ‘King of Persia’s timepiece’, as it is called, is placed right at the beginning of his work in the section dealing with the very earliest clocks. It is the first clock mentioned by name and discussed at length following a short general discussion on sundials and rudimentary Roman, Greek and Ancient Egyptian water clocks. Wood’s placing of ‘The King of Persia’s timepiece’ as the first clock in his chronological study indicates that he saw it a seminal clock that marked the transition of time-pieces from crude to advanced devices. In the mind of this 19th-century European, who almost exclusively discusses Christian-European produced clocks in his work, the water clock of Harun al-Rashid was the first step on the road to modern clocks and watches. Although we do not have a description of the inner workings of the clock that Harūn al-Rashīd gifted to Charlemagne, we know how it might have worked thanks to the 11th-12th century scholar Abū Ḥāmid al-Ghazālī (d. 1111 CE) who was familiar with early water clocks. More famous for his magnum opus on Muslim spirituality, the Iḥyā ‘Ulūm al-Dīn (‘The Revival of the Religious Sciences), than for contributions in the field of physical sciences, al-Ghazālī gave us, in his Arba’īn fī uṣūl al-dīn (Forty in the Tenets of the Religion), a detailed description of the inner workings of what could have been a typical water clock of his time. This could have been the basic mechanism that Harūn al-Rashīd’s clock had been based on, albeit some 200 years earlier. The modern scholar, M.A.Dahman, reproduces this passage. Interestingly, Al-Ghazali’s description of the functioning of a water clock did not come from a book on physics, mechanics, or clock making, but from his Arba’īn fī uṣūl al-dīn, a religious work dealing with Islamic belief. 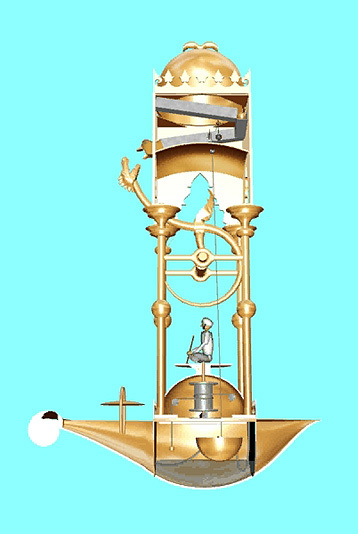 He used the water clock as a tangible example in order to explain the Islamic concept of divine decree and destiny (al-qaḍa wa’l-qadar), which he saw mirrored in the mechanical workings of water clocks. Much data on this clock were collated in order to make engineering sense from these various descriptions. The envisioned appearance and construction of the clock are drawn using engineering graphics software. There were a number of paintings showing a delegation of Harun al-Rashid holding what was envisaged as a clock, but unfortunately none of these tally with the descriptions in historical documents. The nearest to it is a drawing given by Claudius Saunier depicts it in a drawing. However, this cannot be realistic either, as the picture does not show a space to accommodate a water tank, neither does it show a spout for the balls nor a bowl to receive them. Furthermore, the horses are shown to travel around a square path having to turn a right angle. In our opinion the windows would have been in a raw and the clock would have a front face revealing the progressive emergence of the horses and the falling of the balls onto a sound generating cymbal. Figure 8. Harun al-Rashid’s clock as depicted by Claudius Saunier 1903. "In the second passage from Rev. Kenner Davenport’s The Reasonable Horologist, he reflects on man’s early attempts to capture time more precisely. Clepsydra refers to a water clock (its Greek translation is “water thief”) which measures time by regulating the flow of liquid from one vessel to another. Ulrich Alertz, recently (2010) wrote a chapter on “The Horologium of Hārūn al-Rashīd, Presented to Charlemagne: An Attempt to Identify and Reconstruct the Clock Using the Instructions provided by al-Jazarī”. 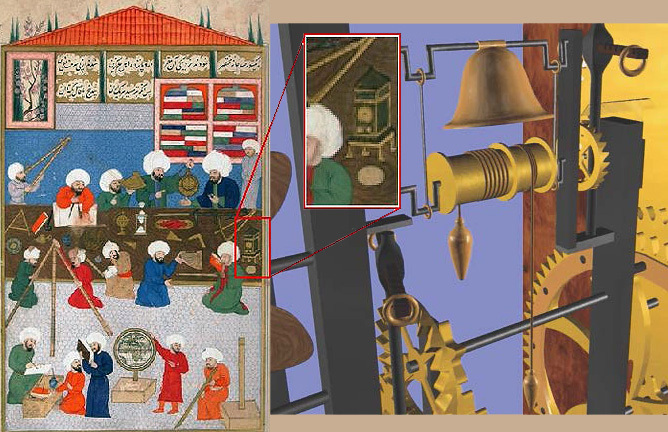 Despite the fact that there were 400 years between Harun al-Rashid and Al-Jazari, the author assumes that Al-Jazari’s castle clock would have been similar to Harun al-Rashid’s clock and uses Al-Jazari’s description of his castle clock to explain the mechanism and working principle of Harun al-Rashid’s clock. We believe this is a challenging assumption as there must have been numerous developments during that period. 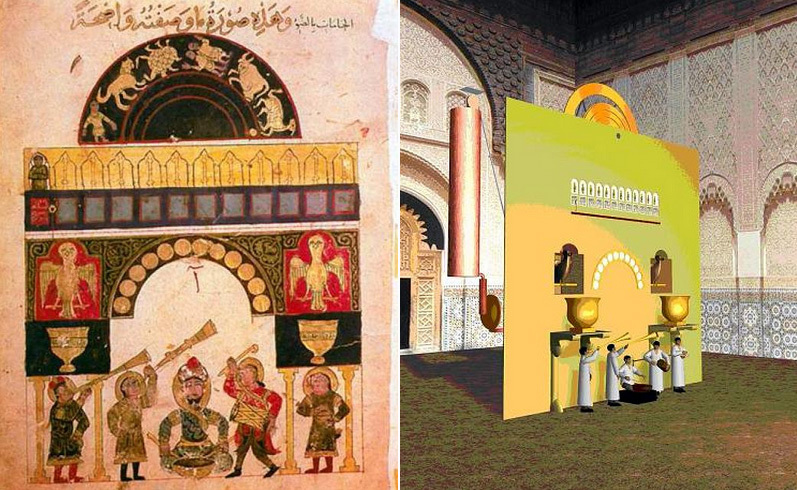 A full description with 3D modelling of Al-Jazari’s castle clock is given by the present author. Besides, some of the features such as horsemen, single spout for the falling balls, the absence of musicians’ automatons and falcons make the two clocks different. Better known for his ground-breaking discoveries in optics, Ibn al-Haytham's work on the water clock (Maqala fi ‘amal al-binkam) is also very significant. In his writings, Ibn al-Haytham gives details of the water clock. He describes it as a new invention in that it gives hours and minutes, which no other clock had previously shown. He refers to making and manufacturing the clock, as well as testing it by trial and error. The time-measuring mechanism he used was a cylinder with a small hole at its base as the prime mover for telling the time. 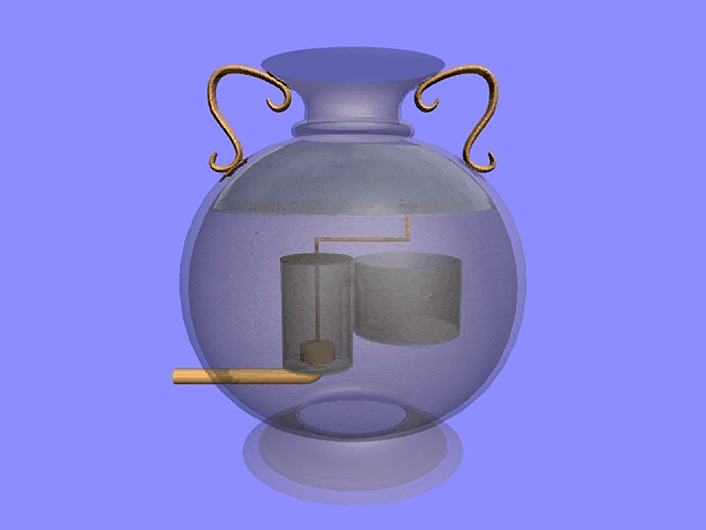 As the cylinder sank downwards into another tank, which contained sufficient amount of water, it resembled an inflow clepsydra, measuring time by the amount of water that had flowed in. This was unlike the clepsydras used in antiquity, which were later adapted by engineers Al-Muradi, Ibn Ridhwan al-Sa’ati and Al-Jazari. These were all outflow clepsydras, measuring time by the amount of water that had flown out. 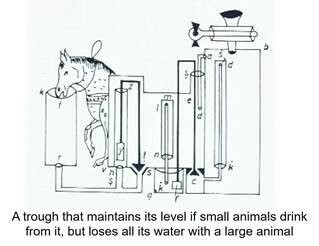 It is interesting that Ibn al-Haytham should use inflow technology for the control of his clock instead of the outflow clepsydra, which should have been well known in Cairo at the time when he was in Egypt. He might have constructed this clock when he was working as an engineer in Basra Iraq before going to Egypt. Originally built in the famous Umayyad mosque in Damascus which had a number of water clocks over the years. Although it is named after Ridhwan it’s his history goes back many years earlier. Ridhwan reconstructed and described it in his book ‘ilm al-Sa’at wa al-‘amal biha (‘The Construction of Clocks and their Operation’), 1203. This impressive mechanical clock displayed the time numerically, and included two falcons that would automatically throw a copper ball into a vase to mark the passing of an hour. At night, a lamp would be lit to indicate the hour by shining through a turning disc. Figure 14. An engineering drawing of the clock that Riḍwān al-Sā’ātī restored, from the manuscript of his ‘ilm al-Sa’at wa’l-‘amal biha. According to descriptions by Ibn Jubayr, geographer, traveller and poet from al-Andalus (Muslim Spain), 1184, the clock had both an upper level and a lower section. By far, one of the most ingenious engineers was Badi'al-Zaman Abū al-'Izz ibn Ismā'īl ibn al-Razāz al-Jazarī, who flourished in the late 12th century and is presumed to have died shortly after 1206 CE. His machines and devices described in his book Al-Jāmi' bayn al-'ilm wa 'l-'amal al-nāfi' fī ṣinā'at al-ḥiyal (A Compendium on the Theory and Useful Practice of the Mechanical Arts) show incredibly sophisticated devices, some working automatically. The most fascinating of them all is the Elephant Clock. One large part of the present book surveys its design and the messages its designer intended to give to its observers, a message that is quite relevant to today’s world. 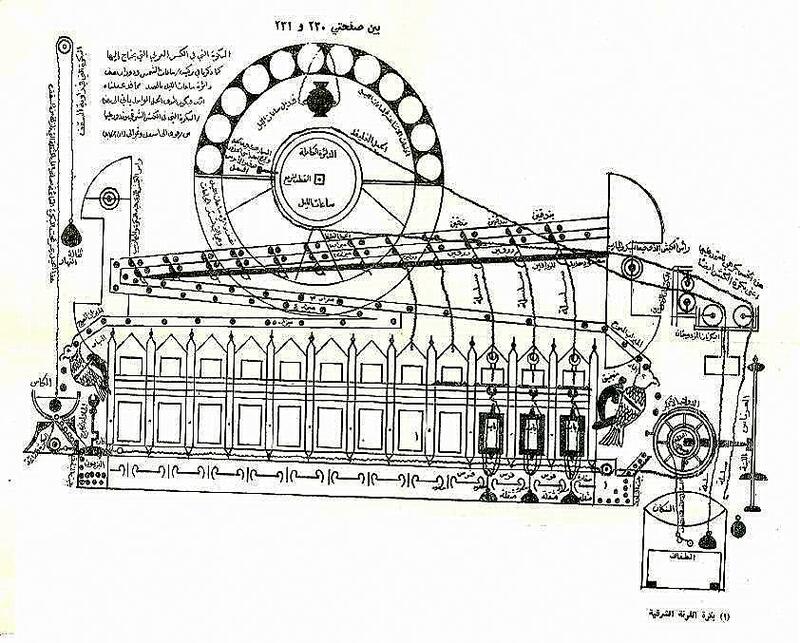 The first machine described by Al-Jazari in his famous treatise of mechanics Al-Jami‘ bayn al-‘ilm wa 'l-‘amal al-nafi‘ fi sina‘at al-hiyal ('A Compendium on the Theory and Useful Practice of the Mechanical Arts') is a monumental water clock known as the Castle Clock. The castle water clock is one of the grandest clocks mentioned in Al-Jazari's book. Details of its construction and operation are described in ten sections of the first chapter of Category I of the treatise. The clock, with its series of mechanical actions that ran throughout the day, would have been very pleasing to watch and listen to. During daylight hours, an observer would have seen the Sun's disc on the eastern horizon about to rise, the Moon would not be seen at all and six zodiac signs would be visible, while the first point of the constellation Libra was about to set. Figures 16-17. 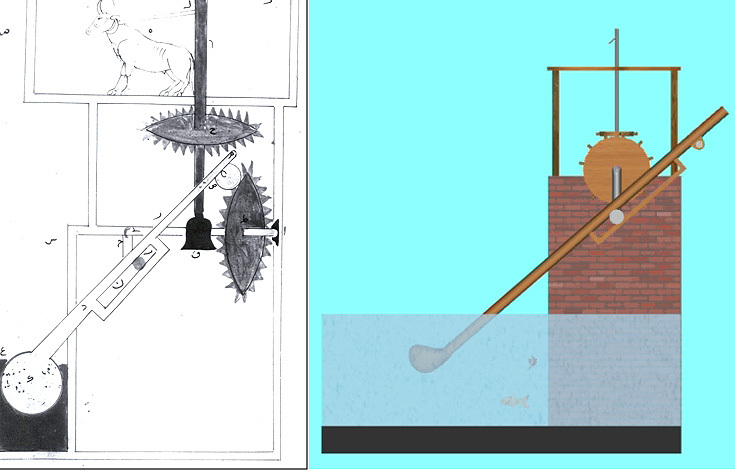 Manuscript view of the castle clock and a snapshot from a 3D animated construction ©FSTC. 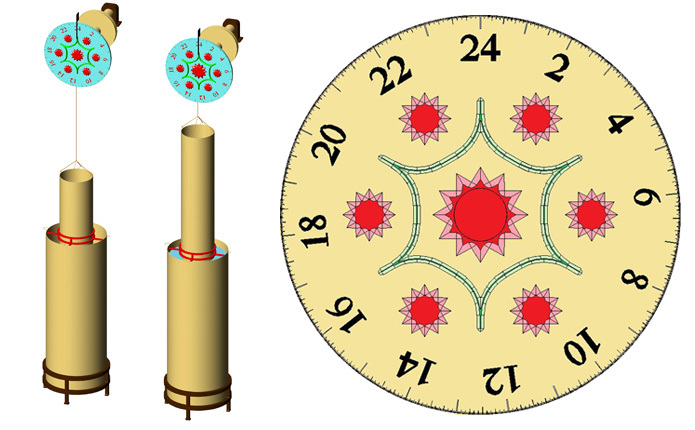 One of the elementary clocks used by Al-Jazari is an adaptation of the outflow clepsydra. It is called the scribe clock. Float moves down as the water leaks out of an orifice at the bottom of a bucket. The float pulls a rope which rotates a pulley on which rests a figurine of a turbaned time teller. As the scribe rotates it points to the time on a calibrated circular disc. Figure 18-19. 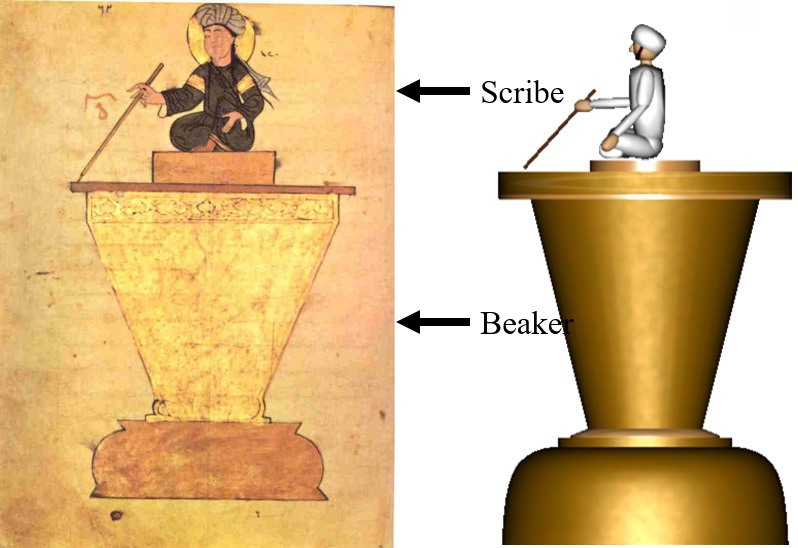 Sketch of the scribe clock from Al-Jazari’s book. 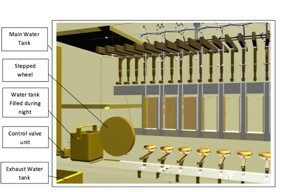 Right: A snapshot from a 3D animated construction ©FSTC. Al-Jazari's 800-year-old automatic Elephant Clock is probably the most famous of clocks from Muslim civilisation. The clock uses Greek water-raising technology, an Indian elephant, an Egyptian phoenix, Arabian figurines and Chinese dragons, possibly to celebrate the diversity of the origins of the technology. Figure 20-21. 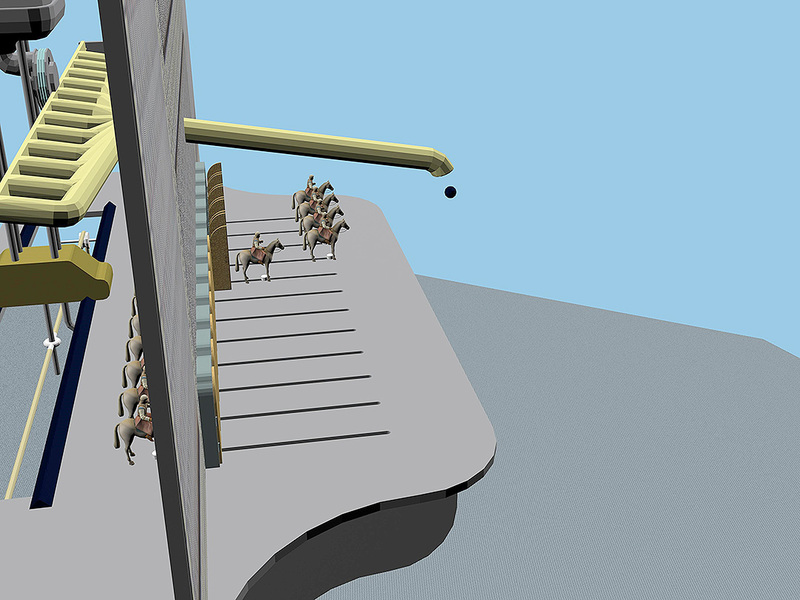 The Elephant clock drawing from Al-Jazari’s book and a snapshot form a 3D animated construction ©FSTC. 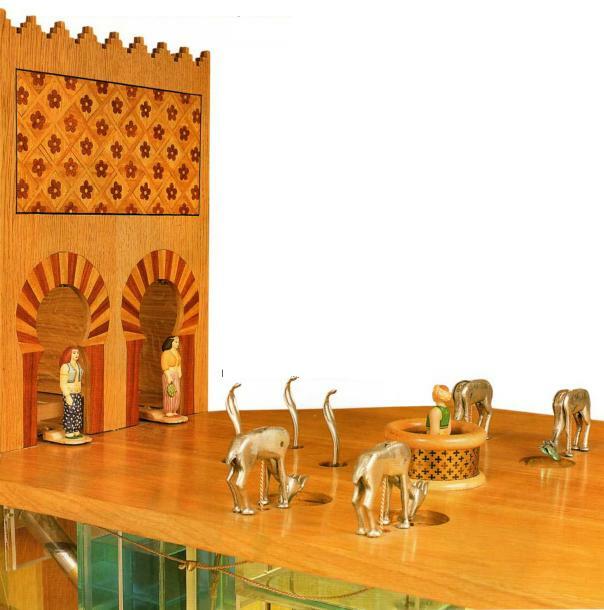 Based on his elephant clock design, Al-Jazari describes a similar clock which he named the Boat Clock. Essentially, it has similar parts and features, except that it rests in a boat instead of on an elephant and when the ball drops out of the Chinese dragon it falls onto a cymbal that chimes. 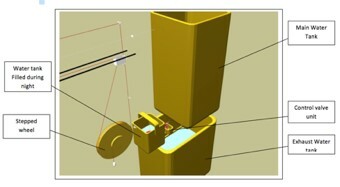 Figure 22-23.The Boat clock from Al-Jazari’s book and a snapshot from a 3D animated construction ©FSTC. In his book 'The Brightest Stars for the Construction of Mechanical Clocks' (Al-Kawakib al-durriyya fi wadh' al-bankamat al-dawriyya), Taqi al-Din Ibn Ma'ruf. Describe in detail the design of a gravity driven clock as well as a spring driven clock with alarm mechanisms. In his clock, he incorporated the use of several escapements, an alarm, the striking trains that sounded at every hour, the visual relationship between the sun and the moon, the different phases of the moon, the devices that indicated the time for prayers and the dials that showed the first day of the Gregorian months. Figure 24-25. In the middle right of this famous manuscript of an Istanbul observatory is an item believed to be Taqi al-Din's mechanical clock. 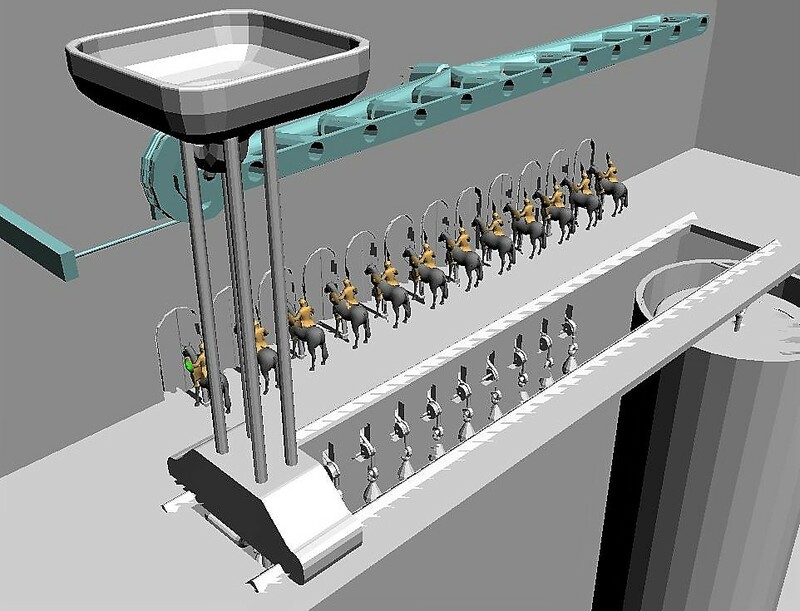 Right: A snapshot from a 3D animated construction ©FSTC. Some of the earliest descriptions of water clocks are available in Al-Muradi's of Kitab al-Asrar fi Nataij al-Afkar (‘The Book of Secrets about the Results of Ideas’). Figures 26-27. 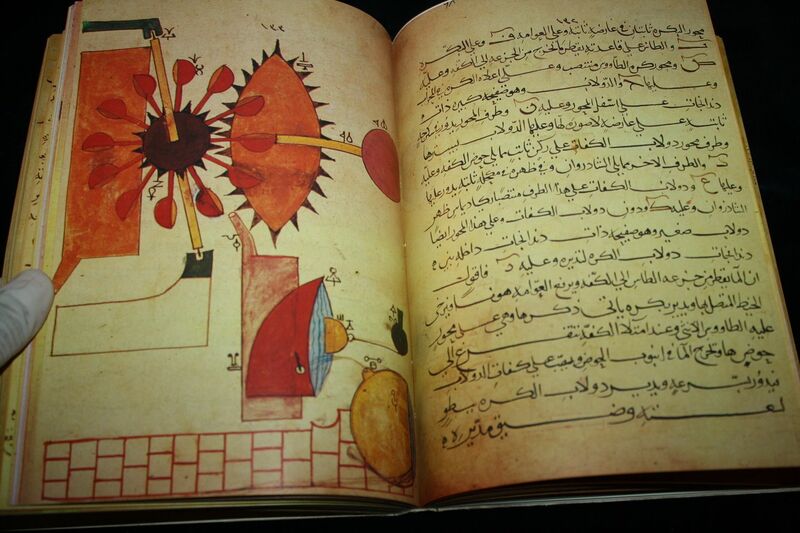 A page from Al-Muradi, 11th century book of Secrets, describing an automatic solar-water clock. 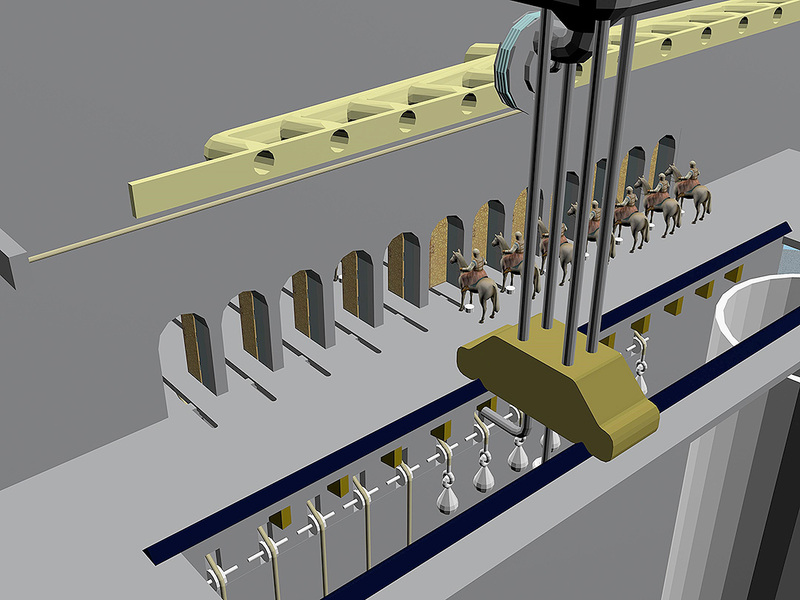 Right: A snapshot from a 3D animated construction ©FSTC. 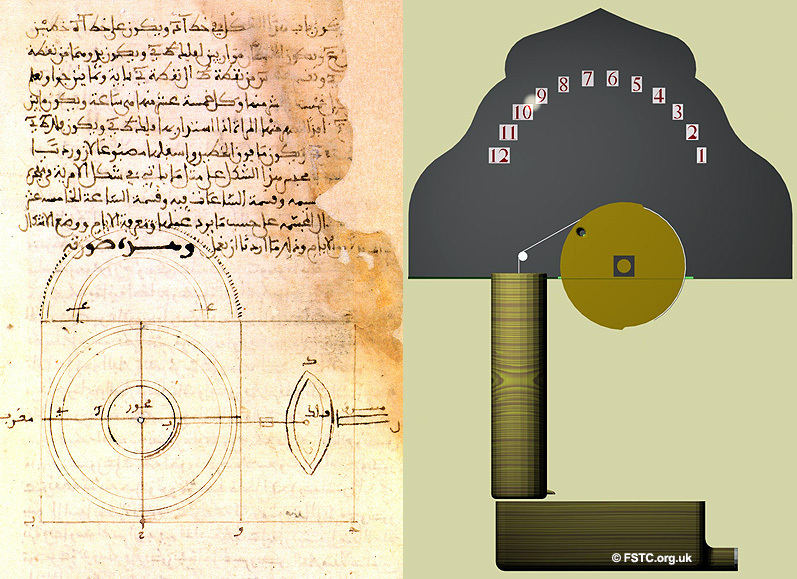 In this book, Al-Muradi uses written instructions and diagrams to describe 31 models, consisting of 15 clocks, 5 large mechanical toys, 4 war-machines, 2 machines for raising water from wells and one portable universal sundial. Figure 28. Reconstruction of the Gazelle clock of Al-Muradi. A general view with its side opening revealing the working of the mechanism. Amongst the most remarkable historical objects in the Maghrib are the clocks in Fez in Morocco. The smaller of these is a water clock operated by levers and strings and without any complicated gear mechanisms. It is located in a room in the minaret of the Qarawiyyin Mosque. The clock is extant but not in working order. It was made in 1286/87 by Ibn al-Habbak al-Tilimsani, and when it was restored in 1346-48 by Abu Abdallah al-'Arabi it was fitted with an astrolabe rete to help track the stars. Thus it could imitate the apparent daily rotation of the heavens about the horizon of Fez. In addition, metal balls would fall through the doors above the clock every hour. Notice the 12 doors under and above the disk; the red wooden structure is the top part of the clock. Figure 29-30. Al-Qarawiyyin water clock located in the room of al-Muwaqqit (time keeper) within the minaret of the mosque in Fes, Morocco ©FSTC. We find several clocks in Fez. Among them is a technological marvel. It is the sophisticated clock of the Bou ‘Inania school, established in the heart of the old city of Fez in the 13th century. 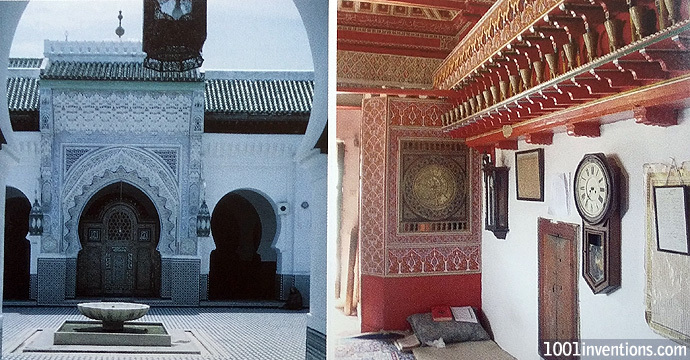 Construction work was completed on the Bou ‘Inania madrasa in Fez in the year 1356. It was built on the orders of the Merinid Sultan Abu ‘Inan Faris al-Mutawakkil (r. 1348-1359), after whom it came to be named. Primarily it was an educational institute, but it also functioned as a congregational mosque for the quarter it was located in, and accommodated shops along the front façade. Figure 31. A view of souq al-qasr in 1928. The remains of the water clock can be seen in the top-left of the photograph. The Bou ‘Inania clock works by means of ropes that cause closed windows to open. The number of windows that are open at any particular moment indicates the number of hours that had passed. At the elapsing of a complete hour, a marble falls from a fixed height into a copper bowl, creating a loud sound signalling the hour. The clock mechanism is powered by the outflow of water from a large water-tank into a smaller water tank, which contains a float and a siphon that siphons-off all the water from it over the course of a full hour. This float is attached by ropes to a trolley that moves backwards and forwards in a straight line on metal tracks. These tracks are placed over the long, wooden bars at the upper level behind the wall. The movement of this trolley along the tracks causes the release of the marbles through channels directing them to fall down striking the copper bowls. At the same time the trolley releases the latch of the closed windows causing them to open one at a time as each hour passes. Figure 32. A close up of the mangana’s console showing bricked window openings and dilapidated parts as well as five remaining copper bowls. There are a number of unique design aspects of this clock; the most important is its size. It is approximately 11 meters wide and 12-meter-high, making it the largest in the Muslim world at the time. 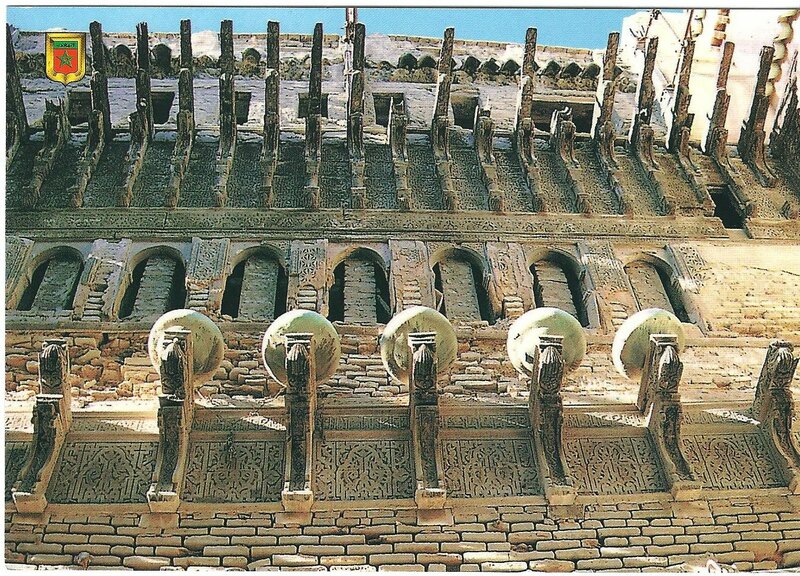 For this clock to operate like those of Al-Jazari, Ibn Ridwan or the small water clock of Al-Qarawiyin, the cart that triggers the release mechanisms of the balls and the windows would have to traverse the whole width of the building. The Bou-Inania clock is thought to be a solar hour clock. It works during the day from sunrise to sunset and the hour is one twelfth of the total duration between sunrise and sunset. Because the length of day changes over the year, the length of each hour also changes. Hence, the water flow into the small tank to which the syphon is connected must have a varying rate. A regulator valve located before the syphon tank achieves this. There is a well-known mechanism used to generate this change by incrementally adjusting the height of the syphon through manual tilting. The amount of tilt is fixed by slots on the edge of the tank housing. The syphon controls the maximum water level in each setting and consequently controls the valve. This feature is found in the Ibn Ridwan’s clock, which was at the Bab Jayrun gate of the Umayyad mosque of Damascus. It was also used by Al-Jazari as a flow regulator in the Castle clock. The mysterious aspect of this clock is that it has twelve windows to indicate the time, but thirteen copper bowls that receive the falling marbles. 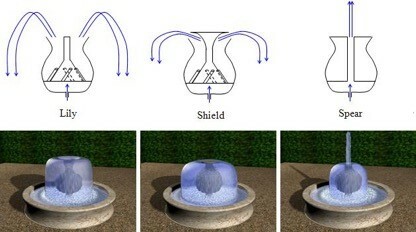 A 3D graphic model was built based upon a number of assumptions, which are thought to be more realistic. Figures 33-34. Rear view of the clock model and general view of the water control mechanism, showing main tank on the right,the siphon reservoir housing in the middle, the main float tank on the left, the stepped wheel on the left and the exhaust tank below ©FSTC. Automated environmentally friendly water raising devices, pumps and windmills were spread across the Muslim world during the Golden Age. Engineers like Al-Jazari and Taqi al-Din designed water-raising machinery aimed to bring water supplies directly to local people and enhance the farming capacity. In this lecture we look at some of these innovative machine. 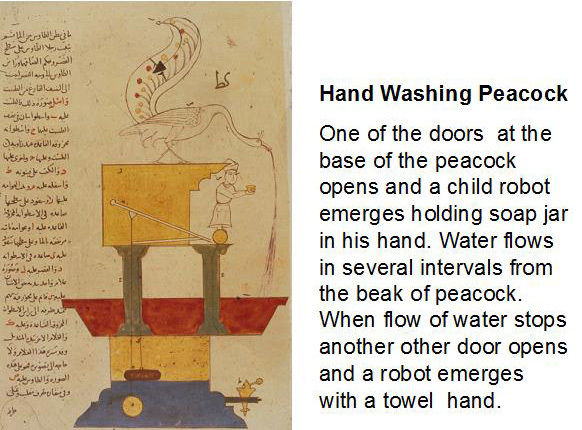 A chapter of Al-Jazari's book was devoted to water raising machines. It also included sophisticated machines powered by water and gravity. The design of a scoop lifting water from a reservoir or a river powered by an animal driving a rotating wheel reveals one of the earliest demonstrations of a device that converts circular motion to a linear motion. As the animal moves , the circular platform on which it stands rotate. Through a right angle gearing system the rotation of the vertical shaft is converted to a horizontal shaft which has a pin sliding through the scoop causing it to go up and down in a vertical plane. The water is lifted through the tube of the scoop pipe and conveyed to a duct carrying the water to its destination. Figures 36-37. A ladle that is raised and lowered with a crank that is driven by an ox and 3D Animated Image of the device ©FSTC. 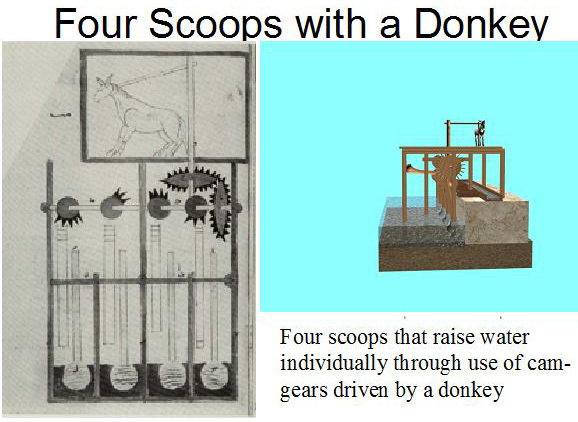 Al-Jazari, then used a multiple scoop system staggered along a shaft with gears having partial teeth. The gears are arranged such that the act like cams to control the sequence of motion. This machine effectively increases the number of water flow rate for each rotation of the driving platform. Figures 38-39.The machine operates multiple gears with partial teeth to produce a sequence of motion in four scoops that took water from the river one scoop at a time. This design included a camshaft, which controlled the mechanism – Right: 3D Animated Image of the device ©FSTC. The Third Water-Raising Device was intended as a decorative attraction near an ornamental lake, with an element of mystification about it. 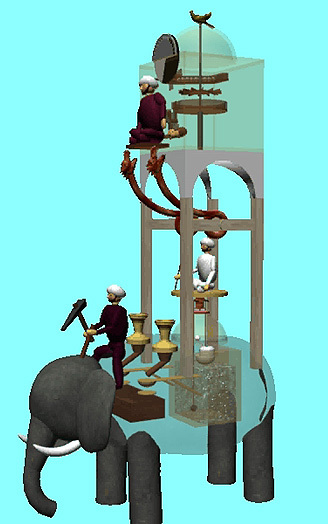 Thence an ornamental lake erects an elegant open structure, with only its automata working parts visible to spectators, thus leaving the spectators curious on how the device is powered (see above image). Consider the nature of al-Jazari’s working environment, it is most likely erected in the King’s garden, where it caused wonder and aesthetic pleasure to courtly circles and raised water for irrigation to the garden at the same time. It was however, simply an elegant development of a utilitarian device that was used for supplying water for irrigation and domestic purposes. A development of the Saqiya, having the main difference of the device being powered by waterpower instead of animal power. The structure itself is quite small, being divided into two sections; the lower chamber whereby the water driven mechanism is ‘hidden’ under the ground and upper chamber whereby the automated mechanism above the pool was made visible. Figure 40-41. Page from a 13th-century manuscript depicting a water-raising machine driven by a water turbine through geared shafts, which turn a sindi-wheel carrying a long belt of buckets. (right: A snapshot from a 3D model animation ©FSTC. This is a water-driven twin-cylinder pump. The important features embodied in this pump are the double-acting principle, the conversion of rotary into reciprocating motion, and the use of two suction pipes. The hand-driven pumps of classical and Hellenistic times had vertical cylinders, these stood directly in the water which entered them through plate-valves in the bottoms of cylinders on the suction strokes. The pumps could not, therefore, be positioned above the water level. This pump of Al-Jazari could be considered as the origin of the suction pump. 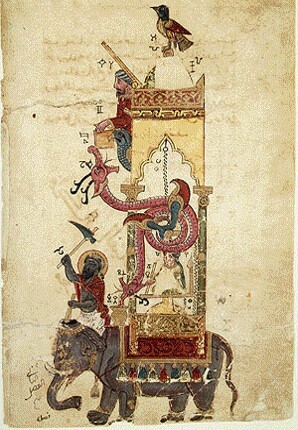 Figures 42-43.A manuscript shows Al-Jazari’s reciprocating pump. This was the ﬁrst time an illustration of a Crank – Connecting rod combination appeared in a manuscript. Right: Computer generated 3D image of reciprocating pump ©FSTC. Figures 44-45. (Left) Third page of the section devoted to the six-cylinder pump in the Chester Beatty MS (p. 38) of Al-Turuq al-Saniya. - (Right) 3D animated image of six-cylinder pump ©FSTC. A thousand years ago, geographer Al-Istakhri wrote of seeing windmills used to provide power, running mills that were built everywhere. Unlike the traditional European design, Central Asian windmills had vertical vanes to catch the wind. Built on top of castles or at the crest of hills, the windmills had two stories. In one story were the millstones, one connected to a vertical wooden shaft. This shaft extended into the other story, where six to twelve windmill sails were mounted vertically, covered in cloth or palm leaves. The structure of the windmill was open to catch the wind on the northeast side. Figures 46-47. A 14th-century manuscript by Al-Dimashqi shows a cross-section of a typical windmill whose vertical vanes rotate around a vertical shaft*, Right: Windmills in the Persian region of Nishtafun. 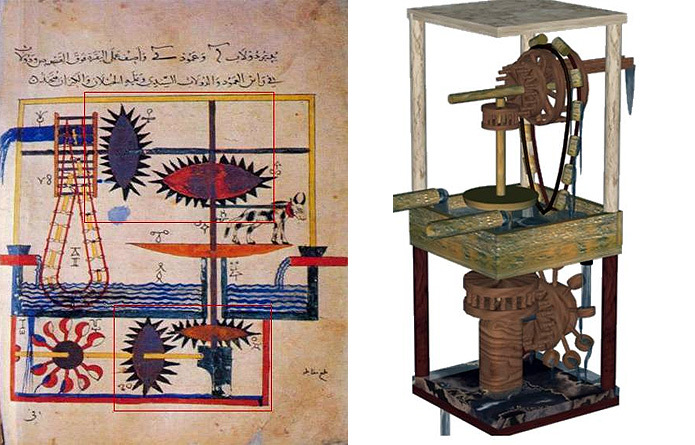 The Banu Musa brothers also produced fascinating machines such as the Hydraulic Organ, wudu' (ablution) water machine, The Self Changing Fountain and a drinking device for animals (See the figure on the right (Figure 48)). They also produced trick devices like a drinking bull and tea-making lady robots. Other devices and tools invented or improved upon from scholars from Muslim Civilisation include a paper-glass-ceramic-pottery making machines, various musical, astronomical, medical, military, agricultural and alchemy instruments. Devices from Muslim Civilisation were used for many practical ends such as pearl fishing, protection in polluted wells, clepsydras used to regulate irrigation time with extreme accuracy through the year, and telling time. With regard to bulky machinery, the same concern for practicality was also in force; water lifting devices, for instance, were used for irrigation, whilst other machinery was used for crushing sugar cane and for extracting vegetable oils. Al-Hassan, in his edition of Taqi al-Din (Taqi Eddin), also points out that the Muslim engineer, from the early days of Islamic civilisation, used his skills and knowledge to build cities and dams, projects for irrigation, and in making machinery that had a wider public use. Figure 49. 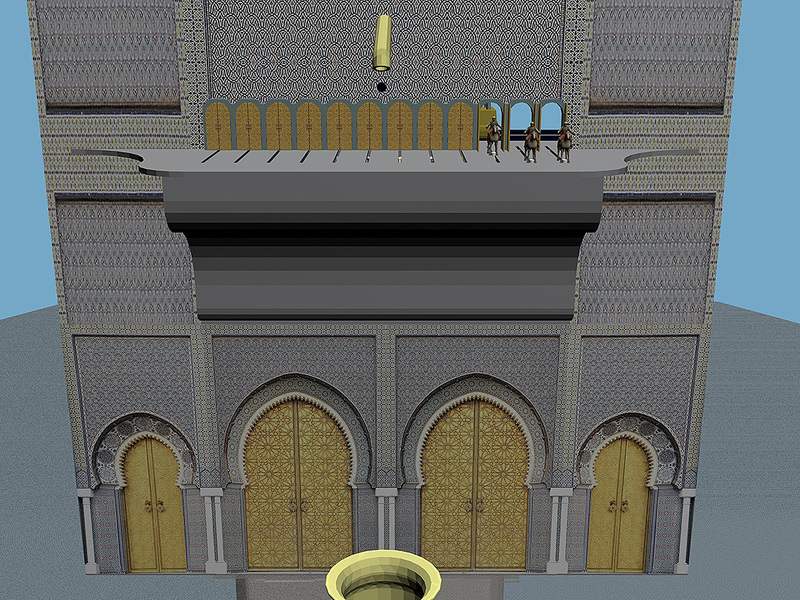 A 3D model of the wudu' (ablution) water machine constructed from Banu Musa's manuscripts (Right). Figure 50. The Self Changing Fountain of Banu Musa bin Shakir ©FSTC. Figure 51. The Self Changing Fountain of Banu Musa bin Shakir ©FSTC. It is proposed that incentives that drove early Muslims to focus on practical knowledge where prompted by their understanding of the religious concept of “Amal Saleh” useful deeds as means of demonstrating one’s faith. It is hoped that the story of the rise of machines in the Muslim Civilisation will not only fill a gap in the educational curricula and the public literature, but will also inspire the succeeding generations to derive positive lessons from the past to build a prosperous, sustainable future that appreciates and celebrates diversity of humanity. Thanks and appreciation are due to Mardin university for inviting me to this conference. Much of the information in this lecture are based on books and articles by the team at the Foundation for Science, Technology and Civilisation whose efforts are beyond any word of thanks. George Sarton: Introduction to the History of Science, Vol.11 Part II, Baltimore, William and Wilkins company, 1931, p.632. "Suite Des Usages Du Temps De Charlemagne. Commerce, Finances, Sciences." In Voltaire: Oeuvres Complètes — 109 Titres Et Annexes (Annotées), 7885. If you go to page 81 it will take you to the entry for the year 801 AD, which is when the first mention of envoys from Harun al-Rashid occurs. Ulrich Alertz, The Horologium of Hārūn al-Rashīd, Presented to Charlemagne: An Attempt to Identify and Reconstruct the Clock Using the Instructions Provided by al-Jazarī, in Variantology 4, “On Deep Time Relations of the Arts, Sciences and Technologies in the Arabic-Islamic World and Beyond”, ed. Siegfried Zielensnki et.al, Buchhandlung Walther Konig GmbH & Co. KG. Abt. Verlag (15 Jun. 2010), pp19-42. Eduard Farré Olivé , De Mensura Temporis. (1ª parte) "Arte y Hora" n. 123-H6, March-April 1997, pp. 8-16 (2ª parte) "Arte y Hora" n. 127-H10, January-February 1998, pp. 10-17; and Eduard Farré Olivé, La clepsidra de las Gacelas del manuscrito de relojes de Al-Muradi.